Inspiring the pursuit of science, technology, engineering and math literacy, skills, and careers. 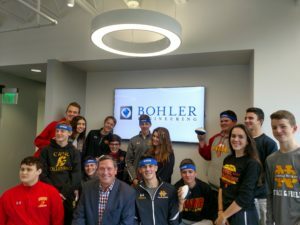 On November 17, The Students of Mrs. Steiniger’s Biology class from Cardinal Wuerl North Catholic arrived at the brand new Pittsburgh office of Bohler Engineering for a STEM Career tour all about sustainability. Bohler has been consulting on land development projects for a few decades now, and while not always demanded, they do consistently attempt to add as many green touches as possible to their projects. 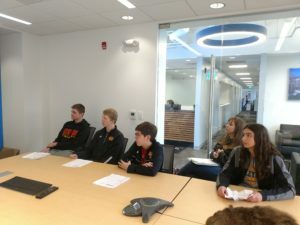 After a look all around at the office space, including some employees very hard at work, the tour guide Micael Takacs took the students into a conference room for a look at some of the projects he personally had worked on. Mr. Takacs has worked on a number of sustainable projects in the area, including the Phipps Conservatory’s Center for Sustainable Landscapes, and the student’s very own Cardinal Wuerl North Catholic High School. Among the green innovations at both locations are clever systems for rainwater collection and reuse and rain gardens meant to prevent excess rain runoff. The students were very excited to learn that things they see every day have sustainable benefits that they were hitherto unaware of, and now can take on an entirely new meaning. Mr. Takacs was also able to share knowledge of other sustainable projects of note and interest within the city, including a recently constructed building that can be opened up and cooled passively with natural air currents. Bohler Engineering proved to be an excellent supplement to the sustainability education being provided by Mrs. Steiniger, and a great foundation upon which to continue building a bright sustainable future.